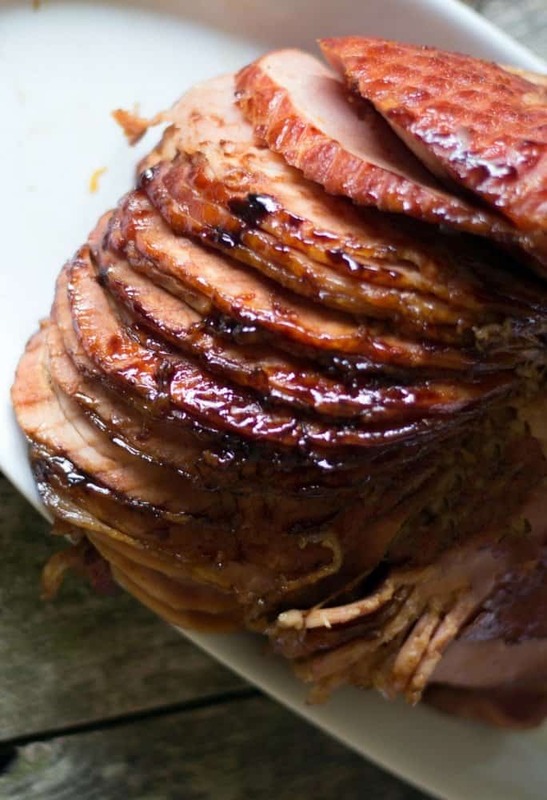 Apricot Bourbon Maple Glazed Ham is a perfect recipe for any family gathering or holiday! This tasty ham is perfect for Easter and Christmas! A no-fuss recipe which makes it great for the cook to enjoy the party! Easy steps to make a perfect roasted glazed ham that will be moist and tasty. 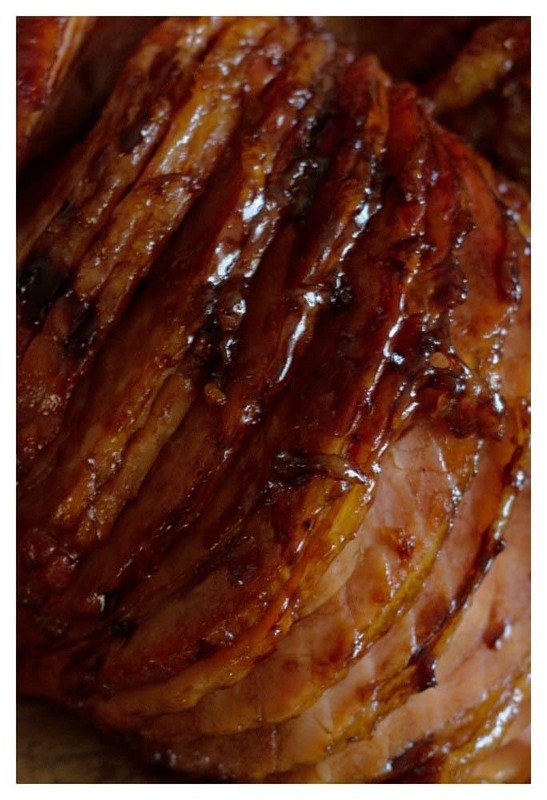 The Maple Glaze caramelizes on the ham adding amazing flavor and is always a hit! 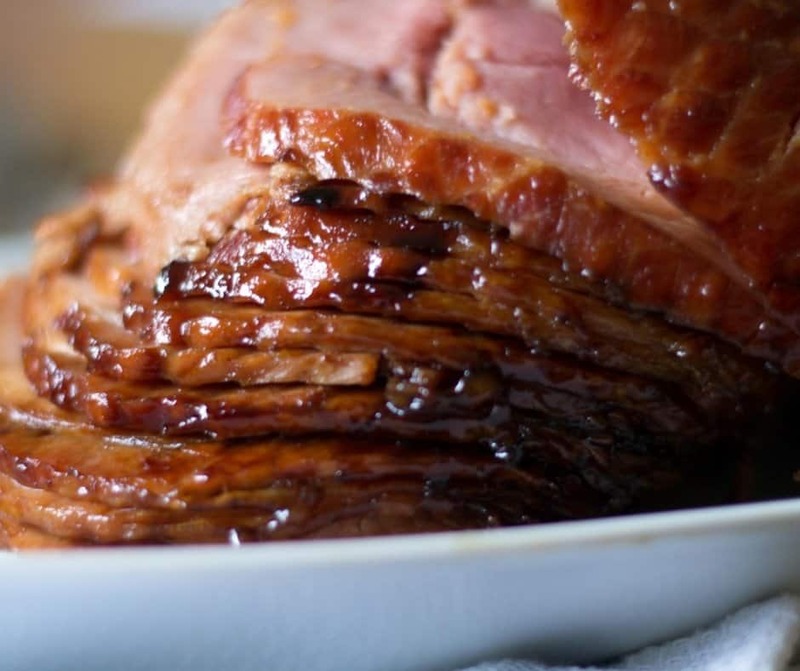 There is nothing easier than a Maple Glazed Ham for any Holiday celebration. Especially when using a pre-cooked sliced ham. It takes just a few minutes to make the ham glaze. In no time at all, a delicious Apricot Bourbon Maple Glazed Ham is ready to be devoured by family and friends! My wonderful Dad had been in the hospital and it was a rough time for my family. Since my large staff was on vacation, just kidding, I’m a one-woman show and I felt it necessary to devote time to my Dad. So happy to say my Dad is home and recuperating! I am so happy to be back because I missed you all! When we have family emergencies, it certainly makes us realize how lucky we are when we have our health! We have a lot to celebrate this Easter! My Dad is home and recuperating nicely. 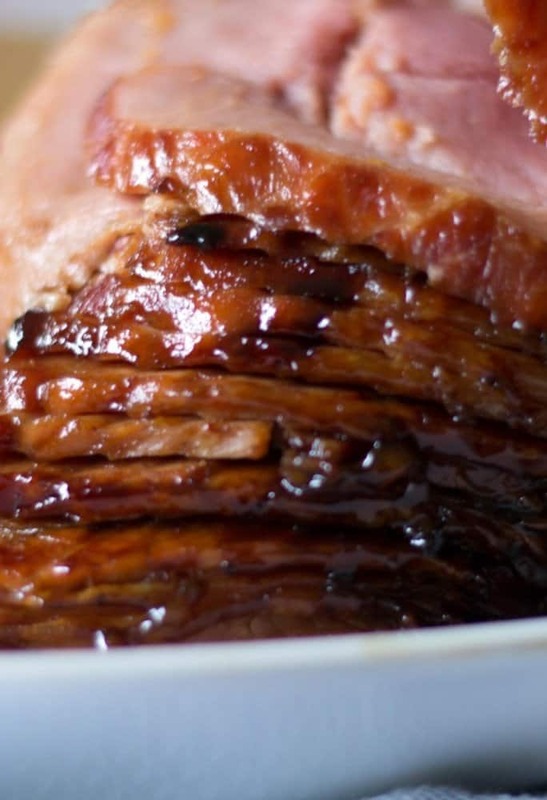 In celebration, today we have one of my Dad’s favorite Easter recipes, Maple Glazed Ham! Oh my, you all are going to love this ham! What I love about this apricot maple glazed ham recipe, besides being super easy, is the amazing flavor and caramelization of the homemade ham glaze! 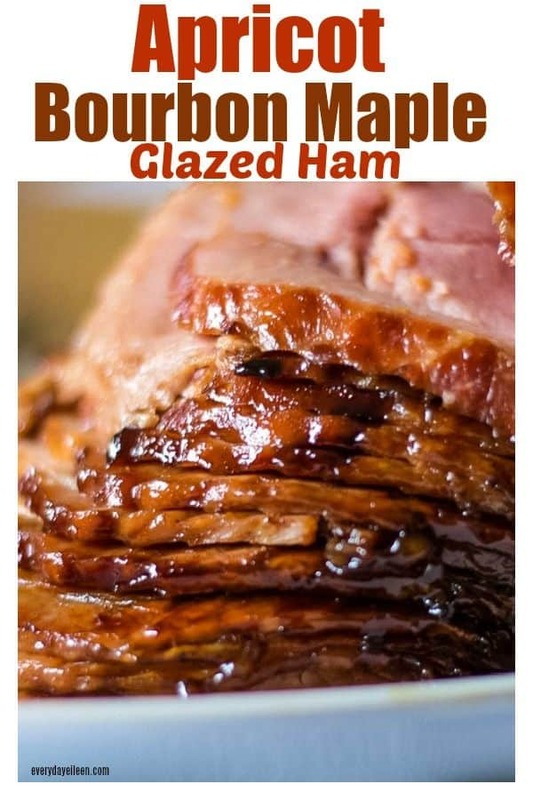 The combination of the apricot preserves and bourbon with the maple make a delicious glaze on the spiral ham. I have quite a few different glaze recipes but this Apricot Bourbon Maple Glaze is special because it’s my Dad’s favorite. Use my guideline below and you will always have a moist and tasty ham. Easter is a favorite Holiday of mine! It is just a really fun family day. We make meals including this easy spiral ham recipe that is just delicious! How do you keep the glazed ham from drying out? Placing water in the bottom of the roasting pan and placing foil around the bottom of the ham keeps the moisture in the ham and it will not dry out. Can the maple glazed ham be made ahead and reheated? I have made the ham a day ahead. Do not slice the ham. Preheat the oven to 300 degrees. Wrap the ham in aluminum foil, place in the heated oven and warm for about 15 minutes. How long can the spiral ham stay in the refrigerator? The ham can keep in the refrigerator 3-4 days, well covered. You can also freeze the leftover ham slices up to 3 months in a freezer bag. Remove the ham from the fridge and place on the counter for a half hour before cooking. Put water in the bottom of the roasting pan. Place a rack in the bottom of the pan. Wrap aluminum foil around the ham and place on the rack. The water in the bottom ensures moisture so the ham will not dry out. If you don’t have a roasting rack, don’t sweat it, just make sure the aluminum foil is well wrapped around the ham. Bake 20 minutes a pound until the internal temperature of the ham reaches 130 degrees. Once the ham is at the correct temperature, raise the oven temperature to 425 degrees. Open the foil to glaze the ham. Leave the foil around the bottom of the ham to catch any glaze that falls, helps with cleanup. Brush half the glaze over the ham and return to oven for about 10 minutes. Remove the ham and turn the oven to broil. Brush the remainder of the glaze on the ham. Place back in the oven for about 5 minutes to crisp up the glaze. In a medium saucepan over medium heat, combine apricot preserves, bourbon, pure maple syrup, Dijon mustard, and apple cider vinegar. The mixture will slightly thicken and will be ready to glaze the ham. Thank you for the continued support! I am forever grateful! An easy recipe that is perfect for Holidays! We love this for our Easter brunch! Use a spiral pre-cut ham for easy preparation. 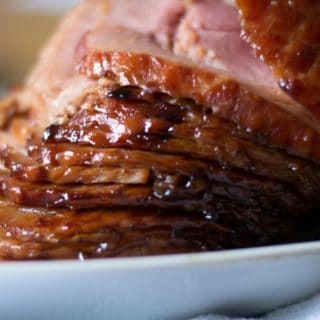 The glaze is a combination of apricot preserves, bourbon and pure maple syrup which makes a delicious glaze on the ham. Remove the ham from the refrigerator 1/2 hour before ready to cook. In a large roasting pan, add about one inch of water. Place a rack in the roasting pan. Wrap the spiral ham in foil. Place the ham in the middle of the aluminum foil. Ham should be well wrapped. Place the ham in the center of the roasting pan, on the rack. Roast in the oven until the ham reaches a temperature of 120 degrees. Usually about 20 minutes per pound. Remove the ham from the oven. Raise the temperature of the oven to 400 degrees. Pull the foil off the ham. Leave the foil rolled at the bottom of the ham to catch any dripping glaze. Place 1/2 of the glaze (recipe below) on the spiral ham. Get in between the slices of ham with the glaze. Place the ham back into the oven for about 15 minutes. Remove the ham from the oven. Put the oven on broil. Brush the remainder of the glaze over the ham. Place under the broiler for about 5 minutes. The glaze will caramelize on the ham. *Do not leave the ham, oven temperatures vary. Do not want to burn the glaze. Remove from the oven. Let rest about 10 minutes before slicing. In a medium saucepan, over medium heat, add the apricot preserves, bourbon, pure maple syrup, dijon mustard, and apple cider vinegar. Simmer for about 3-4 minutes, to blend flavors. Set aside until ready to use. Made this as a test run for Easter. Wow, it is delicious and the glaze is amazing! I am so happy you enjoyed the ham! We love it at our house too! Thank you so much Susan! So easy to make too! What a great recipe! This ham looks mouthwatering! Thank you Iryna! Its a delicious ham! We love it! You had me at bourbon! In all seriousness though, what a perfectly timed recipe. I have some homemade apricot preserves I should dive into, and I think this recipe is a perfect use! Thanks for sharing! Perfect Kristen! I hope you enjoy! Let me know how the recipe goes for you!